UFINET is a neutral fiber optic operator in the wholesale telecommunications market. It provides its services and connectivity through fiber optic in America. The organization was born in 1998 as the telecommunications department of a Spanish multinational company named Union Fenosa, which had been managing the telecom services necessary for the electric exploitation. In the year 2000, UFINET began its period of expansion throughout Latin America, amalgamating with the electricity distribution companies that were acquired at that time by Union Fenosa. Currently, UFINET is one of the largest fiber optic operators in Latin America, with nearly 53,200 kilometers of fiber distributed in 17 countries and more than 20 years of experience. The company’s commendable expansion and growth is currently focused on Latin America, with rapid growth of optical fiber deployment, and presence among three Points of Presence in the United States: at the Network Access Points of the America in Miami, Florida, Los Angeles and 60th Hudson in New York. Iñigo García del Cerro Prieto is the CEO of UFINET. He is a Telecommunications Engineer graduated from the Polytechnic University of Madrid, an economist at the Autonomous University of Madrid, and also holds a Master’s Degree in Business Administration from IESE Business School, Spain. 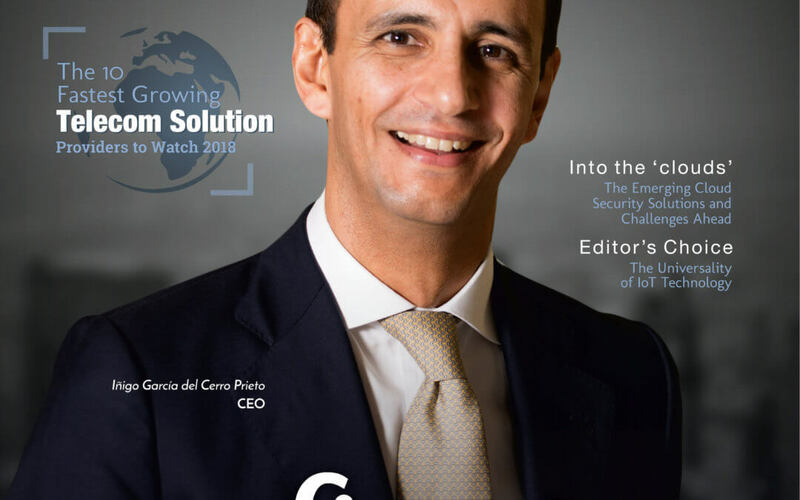 Prior to becoming the CEO, Mr. García del Cerro was the VP of UFINET’s business development which was primarily focused on Spanish and Latin American markets. The main result of his career progress has been the exponential growth of the company itself, particularly in Central America, with a significant deployment of an important optical fiber network and a presence in over 17 countries. Global responsibility for strategic definition, development and international expansion, implementation of the business plan, design of strategic partnerships as well as agreements and relationships with local partners, are the key roles and responsibilities catered by Mr. García del Cerro. 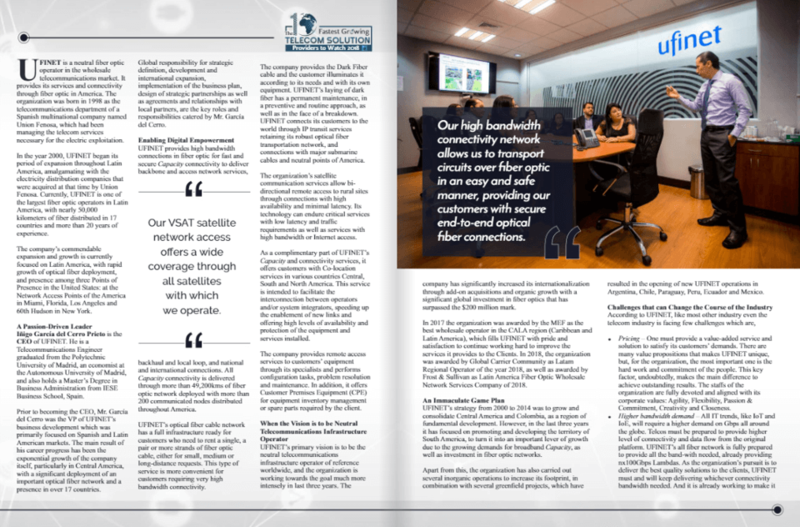 UFINET provides high bandwidth connections in fiber optic for fast and secure Capacity connectivity to deliver backbone and access network services, backhaul and local loop, and national and international connections. All Capacity connectivity is delivered through more than 53,200kms of fiber optic network deployed with more than 200 communicated nodes distributed throughout America. UFINET’s optical fiber cable network has a full infrastructure ready for customers who need to rent a single, a pair or more strands of fiber optic cable, either for small, medium or long-distance requests. This type of service is more convenient for customers requiring very high bandwidth connectivity. The company provides the Dark Fiber cable and the customer illuminates it according to its needs and with its own equipment. UFINET’s laying of dark fiber has a permanent maintenance, in a preventive and routine approach, as well as in the face of a breakdown. 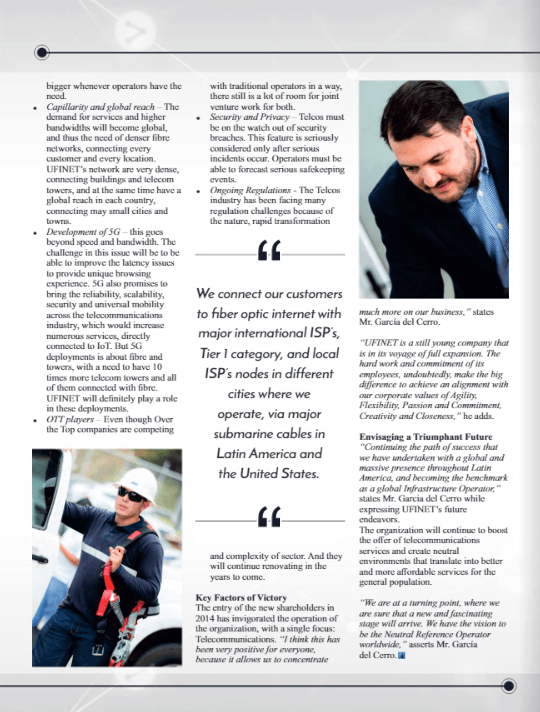 UFINET connects its customers to the world through IP transit services retaining its robust optical fiber transportation network, and connections with major submarine cables and neutral points of America. The organization’s satellite communication services allow bidirectional remote access to rural sites through connections with high availability and minimal latency. Its technology can endure critical services with low latency and traffic requirements as well as services with high bandwidth or Internet access. As a complimentary part of UFINET’s Capacity and connectivity services, it offers customers with Co-location services in various countries Central, South and North America. This service is intended to facilitate the interconnection between operators and/or system integrators, speeding up the enablement of new links and offering high levels of availability and protection of the equipment and services installed. The company provides remote access services to customers’ equipment through its specialists and performs configuration tasks, problem resolution and maintenance. In addition, it offers Customer Premises Equipment (CPE) for equipment inventory management or spare parts required by the client. UFINET’s primary vision is to be the neutral telecommunications infrastructure operator of reference worldwide, and the organization is working towards the goal much more intensely in last three years. The company has significantly increased its internationalization through add-on acquisitions and organic growth with a significant global investment in fiber optics that has surpassed the $200 million mark. In 2017 and 2018, the organization was awarded by the MEF as the best wholesale operator in the CALA region (Caribbean and Latin America), which fills UFINET with pride and satisfaction to continue working hard to improve the services it provides to the Clients. In 2018, the organization was awarded by Global Carrier Community as Latam Regional Operator of the year 2018, as well as awarded by Frost & Sullivan as Latin America Fiber Optic Wholesale Network Services Company of 2018. UFINET’s strategy from 2000 to 2014 was to grow and consolidate Central America and Colombia, as a region of fundamental development. However, in the last three years it has focused on promoting and developing the territory of South America, to turn it into an important lever of growth due to the growing demands for broadband Capacity, as well as investment in fiber optic networks. Apart from this, the organization has also carried out several inorganic operations to increase its footprint, in combination with several greenfield projects, which have resulted in the opening of new UFINET operations in Argentina, Chile, Paraguay, Peru, Ecuador and Mexico. Pricing – One must provide a value-added service and solution to satisfy its customers’ demands. There are many value propositions that makes UFINET unique, but, for the organization, the most important one is the hard work and commitment of the people. This key factor, undoubtedly, makes the main difference to achieve outstanding results. The staffs of the organization are fully devoted and aligned with its corporate values: Agility, Flexibility, Passion & Commitment, Creativity and Closeness. Higher bandwidth demand – All IT trends, like IoT and IoE, will require a higher demand on Gbps all around the globe. Telcos must be prepared to provide higher level of connectivity and data flow from the original platform. UFINET’s all fiber network is fully prepared to provide all the band-with needed, already providing nx100Gbps Lambdas. As the organization’s pursuit is to deliver the best quality solutions to the clients, UFINET must and will keep delivering whichever connectivity bandwidth needed. And it is already working to make itbigger whenever operators have the need. Capillarity and global reach – The demand for services and higher bandwidths will become global, and thus the need of denser fibre networks, connecting every customer and every location. UFINET’s network are very dense, connecting buildings and telecom towers, and at the same time have a global reach in each country, connecting may small cities and towns. Development of 5G – this goes beyond speed and bandwidth. The challenge in this issue will be to be able to improve the latency issues to provide unique browsing experience. 5G also promises to bring the reliability, scalability, security and universal mobility across the telecommunications industry, which would increase numerous services, directly connected to IoT. But 5G deployments is about fibre and towers, with a need to have 10 times more telecom towers and all of them connected with fibre. UFINET will definitely play a role in these deployments. OTT players – Even though Over the Top companies are competingwith traditional operators in a way, there still is a lot of room for joint venture work for both. Security and Privacy – Telcos must be on the watch out of security breaches. This feature is seriously considered only after serious incidents occur. Operators must be able to forecast serious safekeeping events. Ongoing Regulations – The Telcos industry has been facing many regulation challenges because of the nature, rapid transformation andcomplexity of sector. And they will continue renovating in the years to come. Key Factors of Victory The entry of the new shareholders in 2014 has invigorated the operation of the organization, with a single focus: Telecommunications. “I think this has been very positive for everyone, because it allows us to concentrate much more on our business,” states Mr. García del Cerro. “UFINET is a still young company that is in its voyage of full expansion. The hard work and commitment of its employees, undoubtedly, make the big difference to achieve an alignment with our corporate values of Agility, Flexibility, Passion and Commitment, Creativity and Closeness,” he adds. 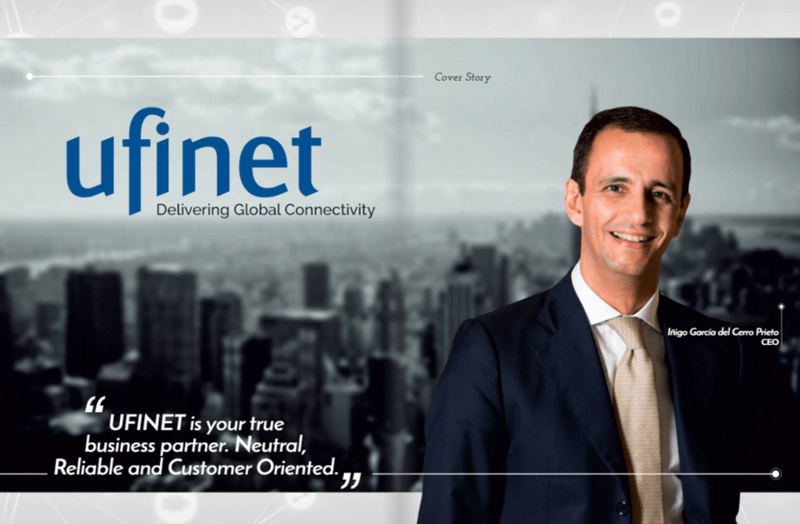 “Continuing the path of success that we have undertaken with a global and massive presence throughout Latin America, and becoming the benchmark as a global Infrastructure Operator,” states Mr. Garcia del Cerro while expressing UFINET’s future endeavors. The organization will continue to boost the offer of telecommunications services and create neutral environments that translate into better and more affordable services for the general population. “We are at a turning point, where we are sure that a new and fascinating stage will arrive. We have the vision to be the Neutral Reference Operator worldwide,” asserts Mr. García del Cerro.